Plastic medical tubing is central to the provision of effective health care in the 21st century. It is essential for the delivery of blood, nutrients and gases to the patient, and for the execution of minimally invasive surgical procedures such as cardiac angioplasty, which have proliferated widely over recent years. This has driven manufacturers to develop increasingly more sophisticated tubing products within shorter time periods to market. Meticulous attention to form and function in development, supported by consistent, high quality production is critical to the success of the device and the safe and effective treatment of the patient. Force testing in the development of medical tubing provides a simple, yet accurate method of qualifying the device’s important mechanical characteristics; it aids optimisation of performance and functionality and conformance to international standards. In production, it provides a quick and inexpensive method of ensuring consistent quality, preventing faults that could have potentially lethal consequences, and damaging legal and financial repercussions for the brand. This article examines four force testing procedures for plastic medical tubing and explores the benefits and methodological considerations of each. Since the late 1980s percutaneous coronary intervention has given cardiac surgeons an extremely effective and minimally invasive method of clearing an artery blockage, and significantly reduced trauma and recovery times over previous surgical methods. The procedure involves threading a guide catheter through the tortuous network of arteries from the arm or groin to the treatment site. A thin, flexible metal guide wire is then threaded through the catheter and extended past the blockage. A second, smaller catheter with a balloon attached to the tip is then threaded over the guide wire and inflated in the narrowed section of the artery to clear the blockage, and if required, place a stent in the vessel to hold its walls open. The ease with which the guide catheter may be navigated through the arteries, its trackability, incorporates a variety of parameters. These include the lubricity of the catheter’s external surface and the forces exerted by the catheter tip at crucial junctures on route to the affected region. Force testing in the development of these devices allows designers to minimise the forces exerted on delicate artery walls and thereby reduce the risk of perforation. 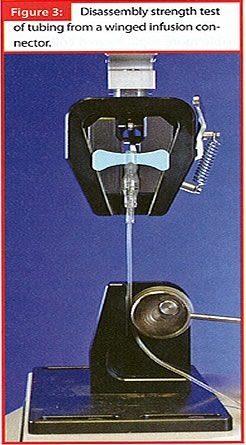 Sophisticated, custom-engineered trackability testing systems comprise a two or three dimensional model of the artery network, and an interconnected system of delicate loadcells that detect the forces exerted on the synthetic vessel walls as the guide catheter is fed through the model. More simple and fundamental tests, however, may be performed with less sophisticated equipment. For example, simple insertion and extractions tests of small samples of catheter into small segments of synthetic artery may be performed on a relatively inexpensive force testing system in early feasibility studies. Similarly, insertion/extraction testing of a sample length of guide wire into the guide catheter can be used to assess the frictional forces experienced as the two materials slide over each other. Further tensile testing of the guide wire itself will enable developers to produce as lightweight and manoeuvrable a device as possible; one that still retains sufficient strength to push through particularly severe or heavily calcified lesions within the artery. Alternatively, the coefficient of friction of the catheter’s external surface may be easily determined on an automated force testing system with a specialised fixture, aiding comparisons in lubricity of alternative potential device materials. These techniques are not, of course, restricted to coronary angioplasty, and similar tests are suitable for catheters designed for other stent placement procedures, including peripheral and renal angioplasty. A simple tensile test of medical tubing can provide much useful information to the developer in modelling the device’s expected performance in situ. In production, it may be employed as a quality control method for early identification of problems in the extrusion process (Figures 1 and 2). There is an ever-increasing demand to decrease the wall thickness of tubing to reduce the trauma caused to delicate body tissues, provide more internal space through which fluids may flow or ancillary instruments may be introduced, and to reduce costs in mass production. Tensile tests can assess the impact of reductions in material usage on the strength and performance of the tubing. Mapping the elastic region of the tubing’s stress-strain curve in a tensile test enables the calculation of Young’s Modulus, a useful parameter in predicting material performance. Other typical measurements include yield strength, the load at which permanent deformation of the material occurs; and perhaps most fundamentally, tensile strength, the load at which the tubing breaks altogether. Conversely, the percentage elongation of the tubing sample at a predetermined force, or at breaking point, may be of most interest. To perform the test, each end of the tubing is wrapped around an upper and lower circular bollard grip mounted on an automated force testing system, and a tensile load is applied at a slow and steady rate until the required parameter has been observed. For routine production floor tensile strength testing, a simple console-controlled force testing system is sufficient. 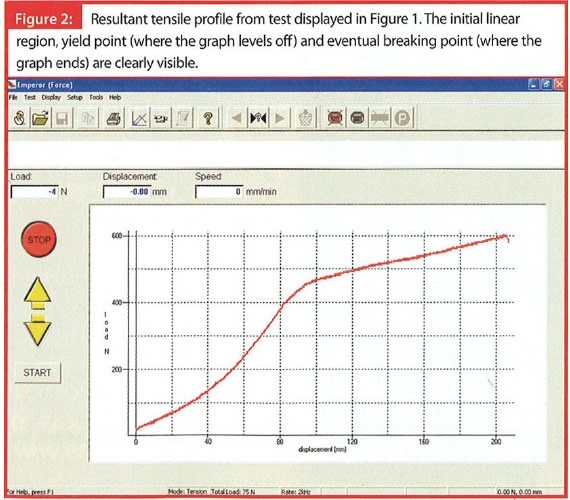 For more complex mapping of the material tensile properties, a computer-controlled system is normally used to enable more sophisticated collection of results, and graphical display of the tubing’s tensile profile. It should also be noted that an extended crosshead travel may be required on the chosen system to effect sufficient elongation of larger samples. Medical tubing joins to terminal connector components by a variety of methods, both permanent such as bonding and moulding, or reversible such as barbed luer fittings (Figure 3). The disassembly force of the tubing from the terminal is a critical parameter in the quality and performance of the device. The force must be sufficiently high to avoid failure in use and ensure an hermetic seal in the joint. In the case of the reversible fitting, however, the assembly force must also remain sufficiently low to ensure ease of use in time-restricted situations. To perform the disassembly test, the connector terminal should be held in the upper fixture of an automated force testing system; a specialised mounting jig may be required to secure the sample effectively. The tubing should then be secured to a circular bollard grip from beneath. This will spread the load evenly throughout the tubing and avoid premature failure at the gripping face and sample slippage during testing. An axial tensile load should then be applied at a constant rate until the tubing has become completely dislodged from the connector. To assess the integrity of the seal within a luer joint, the tubing is pushed over the barbed taper with a predetermined force. Compressed air is then run through the tubing system and the joint placed under water and visually inspected for bubble formation to indicate leakage. The packaging that tubing products are delivered in should be developed and manufactured with almost as great an attention to quality and functionality as the device itself. Well designed and consistently produced packaging will protect the tubing and maintain sterility during transportation and storage, whilst remaining easy to open when required. 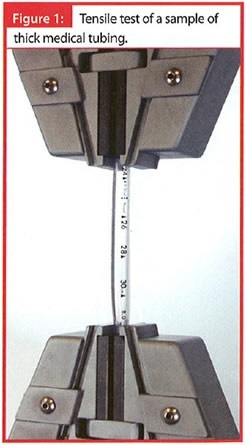 Tensile strength and elongation tests, similar to those described above, may be performed on packaging material in accordance with ISO EN 11607-1, Packaging for Terminally Sterilised Medical Devices, and EN 868-1, Packaging Materials and Systems for Medical Devices which are to be Sterilised, to guarantee conformance to minimum strength requirements. Similarly, pierce and rupture testing of airtight foil and film blister packs provide an indication of resilience to applied forces that may be encountered in the pack’s life cycle. The peel strength of adhesive seals, normally tested on an automated force testing system fitted with a peel table fixture, enables quantification of the ease with which the pack may be peeled open. Finally, the co-efficient of friction of the packaging inner and outer surfaces may be easily determined using the same system, fitted with another specialised fixture. This aids optimisation of form-fill-seal machinery settings in processing and provides an indication of how easily the device may be slid out of its packaging on opening. This article aims to demonstrate that one relatively inexpensive automated force testing system enables a vast range of critical quality testing procedures in the development and production of medical tubing. From tensile strength and elongation testing, to lubricity and joint integrity, investment in the correct instrumentation allows quick, easy and yet precise assessment of the functionality and quality of tubing devices, and is an essential ingredient in the delivery of successful products in today’s fast-moving technological climate.